Well folks I have bad news. I didn't finish the marathon. Here is my race recap. I arrived in plenty of time for the race. My DH and father dropped me off. 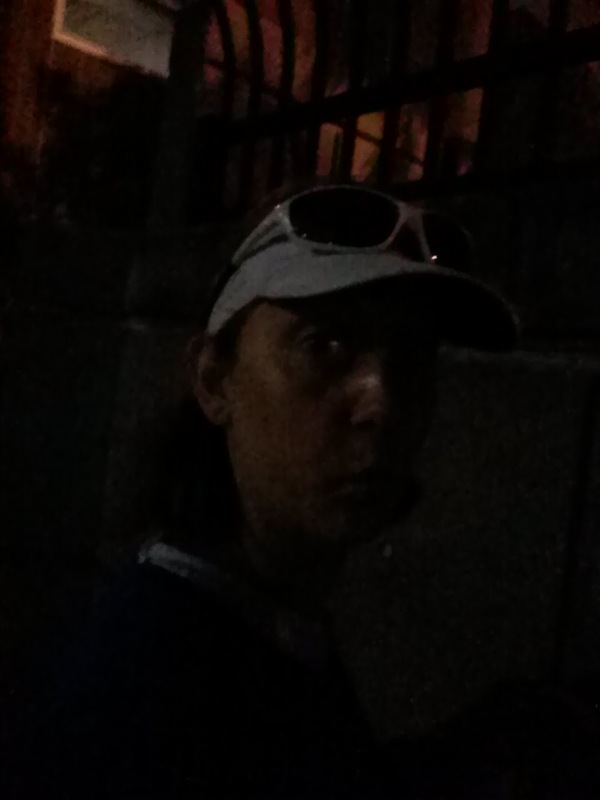 I realized I was dropped off at corral A and needed to be at Corral E. Here is me getting ready in the dark. I made my way to corral E and got in the bathroom line. The line was long even with the large number of facilities that were available. I got finished just as the race was starting. I made my way into my corral with the crowd of people. Here is how it looked from where I was. The start line is about 5 blocks down that road. The gun went off and we slowly started walking toward the starting line. It took me 15 minutes to get to the starting line. 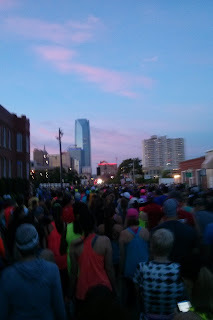 There were 24,820 people registered for the race and I was in the last corral so very back of the pack. I was antsy to start running but assumed the pace would pick up soon. I crossed the start line and picked up the pace. At the same time I was dodging people. There were people everywhere and I was slightly claustrophobic. I continued on running as fast as I could to keep up with the 5:15 pace group. At about 0.5miles I saw a woman on crutches "running" and was trying to avoid her when I tried over the back of a runner's shoe. My right ankle rolled and I went down on my left knee. The runner turned around and asked if I was ok. I didn't respond and turned around and faced the runners coming at me so I wouldn't get trampled. The other runners saw me and I was able to get up. I checked out my knee and it wasn't looking too bad. My ankle was sore but I thought I could keep going. Looking back now I should have just packed it in right there. So I got up and started running again without too much pain. I was able to catch back up to the 5:15 pace group but was not feeling great. I ran past them and kept going. I did stop for water and took a gu. 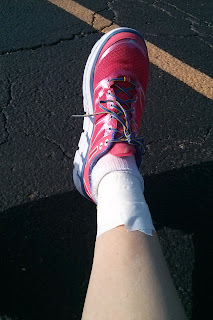 Around mile 6 I saw the medical tent and stopped to get my ankle wrapped. The therapist did a good job wrapping my ankle but it was stiff. I had problems getting used to it being so stiff but could still run. I managed to make it to the turnoff to separate the marathoners from the half marathoners. I did start walking as I was pretty sure I was done. I managed to make it to the second medical tent and tell them I was done. The medic didn't really have any helpful advice. He was able to tell me about the shuttle pick up for the relay teams. The line was 100 people deep so I wasn't very interested in standing in it. I instead headed for the Wilshire Gun club which was near by. I figured it would be the easiest place for my family to pick me up. I would have been better walking west on Wilshire to the other side of the race course. In any event due to where we live and the course, it took them about an hour to reach me. I had plenty of time to consider going back out onto the course. I didn't though. I knew that I most likely couldn't finish under the time limit, and wouldn't be running. I decided I would just have to try again for my first marathon. Here are the lessons I learned. First starting later would have been better. I would have been fine running the course relatively along than running with the huge crowd. I need to find smaller more well organized race. The corrals at the start were not organized very well. 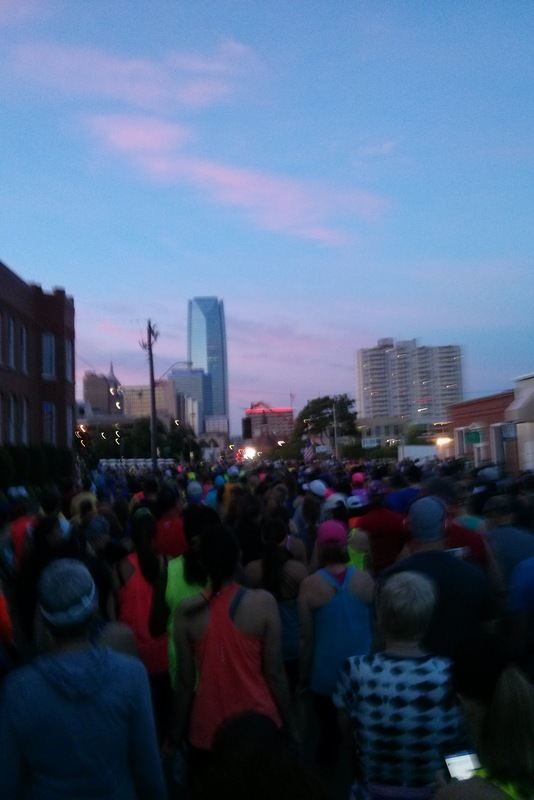 I think the organizers needed to separate the half and full marathoners or at least put them in appropriate corrals. I was in a huge corral with walkers and runners. The start should be staggered as well. One corral was not separated from another. Everyone was starting at the same time and when you have 25k people trying to move it doesn't go well. The 5k runners had to dodge us as they completed their race because they were faster than some of us marathon and half-marathoners. The organizers also need to make sure there is no one of the course who has crutches etc. I do know it is my fault for falling but these things may have helped me complete my race. Feelings: Ugh so disappointed. I was really looking forward to finishing the marathon. I was so defeated after falling. I thought, ugh it happened again. I at least know I can run 20 miles. I wasn't actually fatigued just injured. That has to be the most frustrating part. I know I can run the race but now I have to heal. I am going to give my ankle a rest and do some cross training for a week or so. If it feels better I plan on running next week a few short runs and then might run a longer run on the weekend. After I get back from vacation and my parents head out I think I am going to run around the lake to complete my marathon run. I might train, for a race in the fall but would have to find the right race. I already looked at the Route 66 and it has a lot of runners as well. I am leery of running such a big race again unless I know it is well organized. I will keep you updated on my runs. Well folks this last week before the marathon has been a bit hectic. I have been really busy at work, which is good considering the state of the industry. My mid-week runs went fine. I ran both indoors to keep the allergies at bay ad much as possible. I can't believe tomorrow is finally race day! I am going to break down the food, and stretching I did this week. Food: I wanted to keep it consistent. I chose a high fiber cereal and banana for breakfast most mornings. Friday I was bored and had oatmeal. I had salad with avacado and egg for lunch with fruit. Mid-afternoon snack was a rice cake. Dinner was chicken tenders rice or pasta and a veggie. Today's pre-race day food was eggs and toast for breakfast, chicken and pasta for lunch and I will prob have a light dinner of rice, green beans and chicken. Around 6. Rest: I have been trying to go to bed earlier this week and skipped a fun activity to get to bed earlier. I hope this has helped. Hydration: water, tea, more water. I had my last alcoholic drink on Thursday night. I am looking forward to my post-race homebrew. Today I have been constantly drinking. I want to make sure I am not dehydrated at all going into tomorrow. Care: I now hate the rolling pin. My DH has been rolling me this week. I definitely notice a difference. I will have one more rollout tonight. I have soaked my feet twice this week as well. 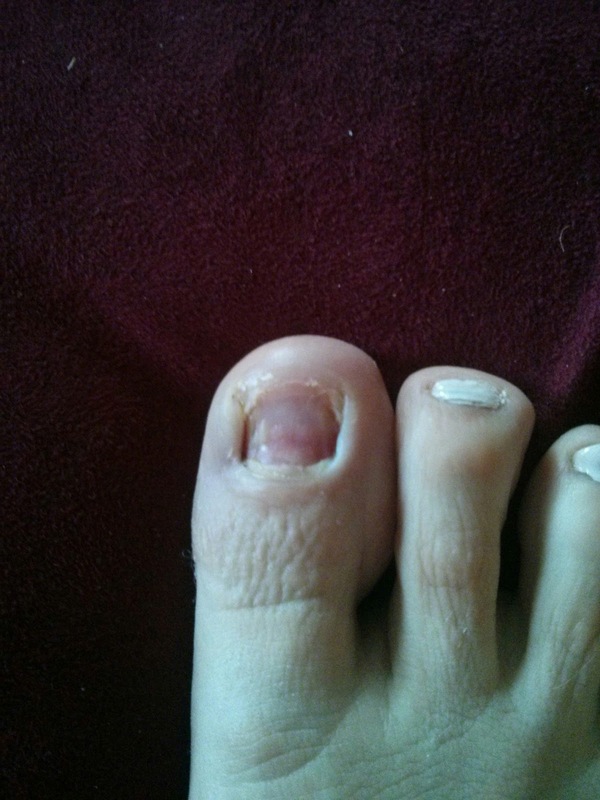 I may have picked at my missing toenail last night. I was a little concerned after getting back from an event ad it was starting to hurt. The soaking in Epsom and neosporian seem to be working wonders though. I won't let anything stop me now!! Weather: well what do ya know it will be windy. Remember all this training runs up hill and in the wind? Well they are going to come in handy. Sustained wind by 10:30 will be in 20s with gusts of 40. The wind will be coming from the South so the last couple miles will be awesome(hard). What are ya going to do? I have done all I can and stuck to my training plan. I have eaten and hydrated and now all there is left to do is run. I hope to see you out there tomorrow running to remember! I finished up my last long mid-week run yesterday. First I will recap Tuesday's interval training. Tuesday I was scheduled for 3x1 mi at 11:15 min/mile pace. I was feeling pretty good after recovering from my long run on the weekend. The weather was perfect outside and I got to enjoy while walking the dog before my run. I dropped him off at home which he was not too happy about. My DH was out of town and poor doggy doesn't like being left alone. Anyways with his puppy cries as motivation to get home sooner I set out. I may have broken my PR for a 5k while I was supposed to be tapering.....oops. I finished my run in 33:40! Fastest 5k yet. I really was tired after the run and calves were sore from the hills around my house but I did it!! Tom. is my final long run before the race!! I can't believe it is almost here. I am excited and nervous and ready to be done!! I am really looking forward to the pancakes tom after I finish running. They will make getting up at 6:30am much more bearable. Well I am slightly disappointed in myself. Today was a 15 mile run. My training is starting to taper off. I had the redbud classic at 2pm. I talked if over with my DH and decided to run outside for 9 miles before the race. Guys it was rough. The weather had been overcast and cool, but the sun was out and the wind had died down a bit by the time I left for my run. I was fighting the whole 7.5ish miles back to my car. The area where I ran is hilly and did not do me any favors. I just kept telling myself, " this will be worse than the marathon because it is hotter." I am hoping this will be true on race day since we are starting at 6:30 am. After getting back to my car I changed my socks and shirt. I ditched the extra shirt with longer sleeves I was going to wear. It was just too hot. Luckily I didn't get any chaffing. I was as quick as possible since I didn't have much time. My first 7.5 miles were around 12:24 min/mile. Not bad considering wind, heat, and hills. I started my mile trek to the start line. A note to all race coordinators if you have a different start and finish please have adequate transportation. Anyways I jogged a bit of the way to the start. I am counting this as part of my training but prob shouldn't since I wasn't running the whole time. I met a very nice woman while waiting for the race to start. She kindly gave me some sunscreen as mine had all sweated off and I didn't think to bring more. I am definitely investing in some waterproof sunscreen packets for race day. Anyways, the sun was brutal and I stayed hidden as long as possible. Not having lunch was a bad idea as while waitin I started to get hungry. I had planned on having a gu near the start but had cabed when changing and had it 45 min before the race. The race started at 2 and we were off. The course changed this year and there was noonster hill at the start. I was very appreciative of this. I really tried running the first mile but it was so hot. I ended up walking sooner than I wanted. The rest of the race was more of the same. Overall I am pretty happy considering the late start, hills, and wind. I am going to rest up the week and see if I can crank out 10 miles at 11:30 next weekend. Hope your races went better this weekend. My weeks this week have been going well. On Tuesday I ran 4 miles at 5 mph on the treadmill at work. I went at lunch and it was packed. I luckily was able to snag a treadmill. My runs seem to be getting easier and easier. I really am enjoying my short runs now. I decided to wait to do my 2nd mid-week run on my day off. Today was my day off and I slept in extremely late. I ate some delicious breakfast and waited about an hour to run. I was going to go to the lake and run. I saw that is was about 10:30 am and by the time I would get to the gym it would be open. I was the second person at the gym! It was great. My run went well. I did a 7X0.5 miles run. The 0.25 mile intervals went well but I did end up resting at 15 min miles for about 0.1 miles. The rest of the day I ran errands and stopped by a winery I had been meaning to try. Tonight we are going to enjoy Grimm, beer, and popcorn. 20 Miles in 4 hrs 9 min! Wow you guys, yesterday was a lot of running firsts for me. First time getting up for a training run at 5 am on a weekend!! First time running into a South wind for 3+ miles. First time running with a training group. First time completing 20 miles strong and still running a decent pace. 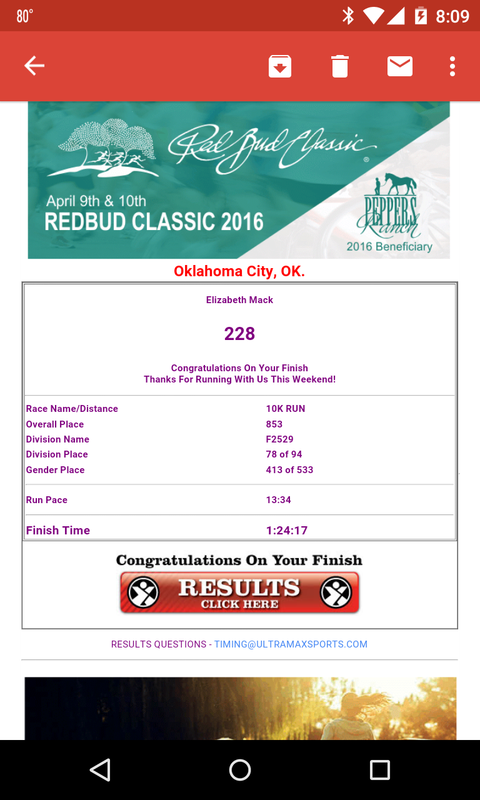 I am so glad I decided to run with the OKC landrunners on my 20 mile training run. Everything went pretty great. I was so thankful for the water stops. The run followed the marathon course for the first 10 miles I think. I got to experience the hilliness that is OKC. I am glad I worked some hills into my training runs. I am thinking of stepping up my hill training this week on the treadmill. I did start to tucker out around mile 17 again. I am hoping this has less to do with the hills and more to do with the wind. I was able to keep running more than the A2A race though from mile 17-20. I did abandon the course around mile 18 or so when it had us doing another North South loop. I decided to head back to my car. I made it to within a block of my car and was at 20 miles. Talk about good planning. After the run I was in a bit of a daze. The rest of my day involved chores/cleaning and rest. I ended up taking a bit longer to get my chores done then for a regular Sunday. I can't imagine why. I did soak my feet in epsom salts to help treat my toe. My toe didn't hurt a bit and did surprisingly well on the run. I also had my husband rolling pin me. I can tell you this hurt, a lot. I have never cussed so much before in my life. Luckily it helped a ton. I feel like I was able to walk around much better today than I was after the A2A. I am off to finish lifting, do some yoga, and make and eat some delicious treats. I consulted a running club in the area for advice about my defective toenail and some relatives who have played contact sports. The advice from the running club was to wait until the nail could be wiggled off. My relatives suggested cutting the nail back and filling it down. The nail wasn't really bothering me to much so I thought I would let it alone. Well after work I had changed my mind. This is what my toe looked like on Thursday after I got done running 5 miles. I put antibiotic cream, and a bandage on it on Wednesday night. I had little bleeding and almost no pain. Thursday morning I bought more supplies at Walmart. I wore open toe shoes so as to not compress my foot. I kept my bandage on for running. I successfully completed 5 miles at 4.9 miles per hour. I was and am very happy about this! No blood or pain. I got home and took off the bandage and it looked fine. I am still nursing my foot. I am keeping a bandage and cream on it on when wearing shoes and out where I could get it dirty. Today I had to wear closed toed shoes for part of the day. I just kept a bandage on my toe. Everything seemed to be fine. I did switch to open toed shoes when I got to work. I soaked my foot in epsom salt when I got home today. Everything seems to be going well. I am going to baby my foot as much as possible. I am slightly worried about my 20 mile run. I am not sure if I will wear a bandage that wraps around my foot. I may just wear a very sticky bandage and call it good. We will see what happens and I will let you know of course.